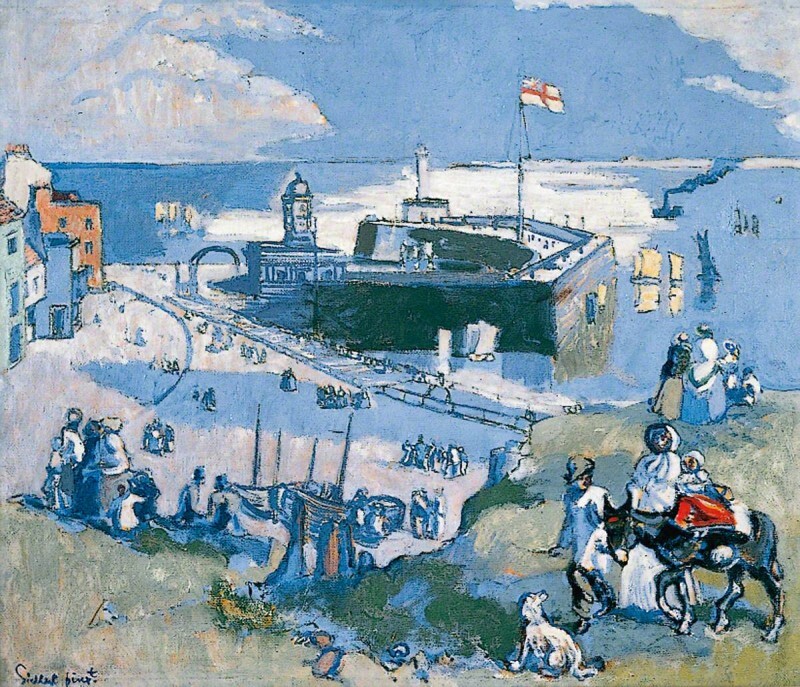 Martin Hopkinson considered a Walter Sickert painting, catalogued as View of Ramsgate in the Kirklees Museums and Galleries collection, as likely to be one of the artist’s ‘echoes’, paintings inspired by nineteenth-century imagery. Specifically, Martin thought this painting was 'Margate in the Time of Turner'. He suggested J. Roberts’ engraving after W. H. Bartlett, titled 'Margate Pier and Harbour' in 'The Watering Places of Great Britain and Fashionable Directory', 1883, as the source of the image. 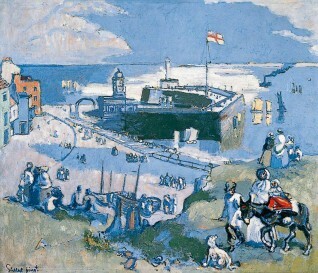 Margate in the Time of Turner had been exhibited twice at the Beaux Arts Gallery in 1937, and perhaps painted when the artist lived in St Peter’s, Thanet. Kirklees Museums and Galleries had no additional information on the painting but held correspondence referring to the work as an ‘echo’, and a 1973 letter suggesting that it was the painting Paragon and West Cliff, Ramsgate, which had been exhibited in Society of British Artists annual exhibition, 1885. Matthew Imms compared it with William Daniel’s 1823 aquatint Pier at Margate; while Andrea Kollmann suggested that it the painting may have been based on an illustration in an 1852 edition of the magazine ‘Leisure Hour’, labelled Margate Pier. Malcolm Fowles consulted a book on Walter Sickert’s work by Wendy Baron, a noted voice on the Camden Town Group, and found an entry for Margate in the Time of Turner (after Francesco Sargent), without an image. A link was then made between Kollmann’s find in ‘Leisure Hour’ and Sargent’s engraving. Sickert drew on magazines for his ‘echo’ paintings and based some on landscape engravings by Francesco Sargent. Since there were two artists of a similar name, a father and son, the family’s genealogy was discussed by Art Detectives before reaching an agreement that the father George Frederick Sargent produced the engraving in ‘Leisure Hour’, and not his son, George Frederick Francesco Sargent. So, Pieter van der Merwe confirmed Kollmann’s early identification to be correct. The painting appears to be one of Sickert’s ‘echoes’ (c.1931–1932), of Margate in the Time of Turner, based on a print from an edition of ‘Leisure Hour’, published on 29th July 1852. This identification was accepted by the collection, and the Art UK record was updated. Is this one of Sickert's Echos? Is it 'Margate in the Time of Turner'?